Last night, Lucy did something that I have never done and always wished I had--she got on stage and sang. Sure I've been on stages and I do my thing (dance, talk, tell stories, try to crack jokes) but I've never really sung, not well anyway. 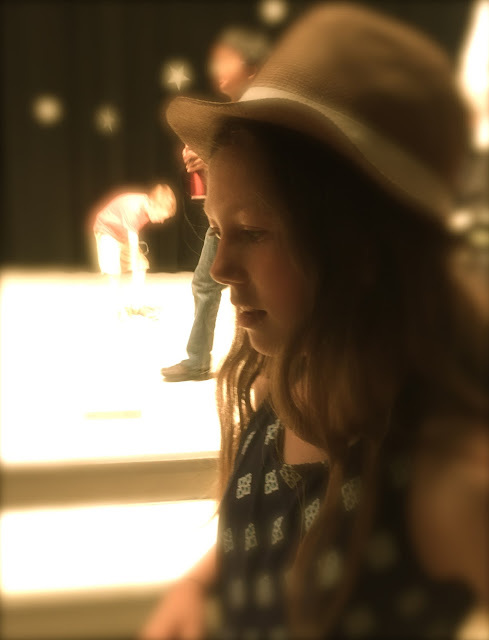 A couple weeks ago, Lucy told me she wanted to try out for her fifth grade talent show. I thought maybe she'd play the piano because she takes lessons and plays beautifully. I thought maybe she'd want to do a dance routine with her friends. But I was wrong. "I'm going to sing," she informed me. "By myself, without my friends," she informed me and then exhaled loudly like she'd been holding it in and afraid to say it. For some reason, it was important for her to do this whole singing on stage thing by herself. I offered to help pick the song or practice with her or even choreograph a few moves, but she declined. This was her thing. It wasn't about her friends and it wasn't about her mom, this was about her being brave and finding her voice and doing it on her own. The only thing she asked for was if she could get a new dress for the show. And of course, she picked the dress. I was so curious yesterday, the day of the show, because I had no real idea of what to expect from her singing. Lucy didn't seem that nervous, which made me even more nervous. But I shouldn't have been. I should have trusted Lucy and her choice of song and style and her quiet confidence and determination. Because once she was on stage, she sang beautifully. The song she sang seems like the perfect song for us right now, and maybe forever. We are going through all sorts of milestones and transitions as a family--no more preschool for Wade (or anyone here which is kind of crazy because we've had almost eight years of consecutive preschool around this house); Lucy is heading to middle school and a more intense Tween Land; Peyton is getting taller and more man-like every day; and I'm thinking about new jobs/career ideas and new identities. I'm learning to let go a little and encourage them and love them the same but differently. Things are different. I'm paying more attention to friends that have kids graduating from high school because we are only a few years away from Peyton graduating. In some ways I feel like we were just having conversations about getting him adjusted to daycare or me adjusted to leaving my job to be a stay-at-home mom. But that was 12 years ago. So yeah, that song is sort of our forever anthem because we are all always in the middle of starting over in some ways...finding new rhythms and routines and roles. And like Lucy sang so beautifully last night all we can do is get started and hold our breath and "just believe." Lucy, or Super Lucy as we used to call her (after she asked us to), showed us last night that we can all exhale a little and be brave and find our voice and create new beginnings and keep starting over and do things our own way and keep believing. And THAT is pretty damn cool, I know that for sure this week. This song and the video are the bomb. I loooooooove this so much--the lyrics, the dancing, the way she just goes for it, the strutting, the jumpsuits, the sisterhood, the curves, the RV. Mecury is in retrograde again. Booo. Dogs bring out the little kid in even the coolest teenager. It's cool to be a "featured member" somewhere. I'm especially excited to be a featured member at One2One Network because I love working with them and love doing product and music reviews for them. They asked me a few questions for this feature, questions like "what's your secret ambition?" Check out my answers and my not so secret (anymore) ambition. What do YOU know for sure this week, right now? Tell me here or over on my Facebook page. Your Lucy is beautiful, inside and out. Lucy is one brave/amazing girl, just like her momma! I just adore that video. And you could have been describing my Tim when talking about Harry Potter, because mine loved the books and stood in line for them too! Have a great weekend, my friend! Go Super Lucy! I am so impressed that she did that. I could NEVER do that. She sings beautifully. And that Harry Potter video. You were not kidding. TEARS. I love HP fiercely. Lucy is very brave! And she has an excellent role model in you, my dear. i can't wait to see you in July! I am also a HUGE HP fan. Love this.